It’s no surprise that the culture of how people work has changed. Many of the traditional concepts of the workspace have shifted to concepts of sharing, transparency and collaboration. This shift in how we work, and where we do our work, has resulted in open office spaces. Closed doors and rows of isolated cubicles have turned into co-operative work stations and joint desks. Enter the Loop Phone Booth, a product manufactured by ONETWOSIX, a Canadian industrial design and creative studio based in Edmonton, Alberta. We help businesses turn great ideas into beautiful and functional products that can be manufactured efficiently and cost effectively. Our approach to design is human centered and we believe that products can be created without aesthetic or functional compromise. 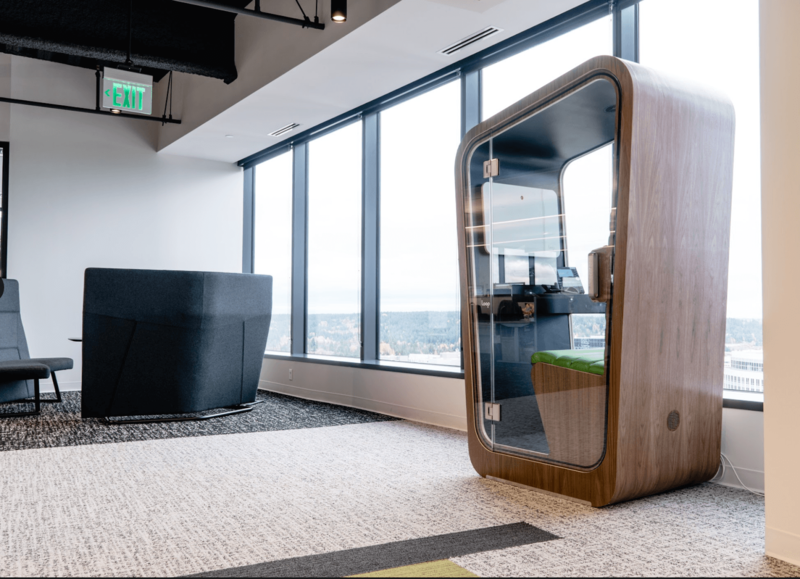 ONETWOSIX design shakes up established industries by using a unique approach with a strong focus on prototyping to create game changing, innovative products.In this day and age, private phone booths are a necessity to help add privacy to the open concept office space. Pokémon quickly realized this as well. Pokémon recently moved into a new office space in Seattle. 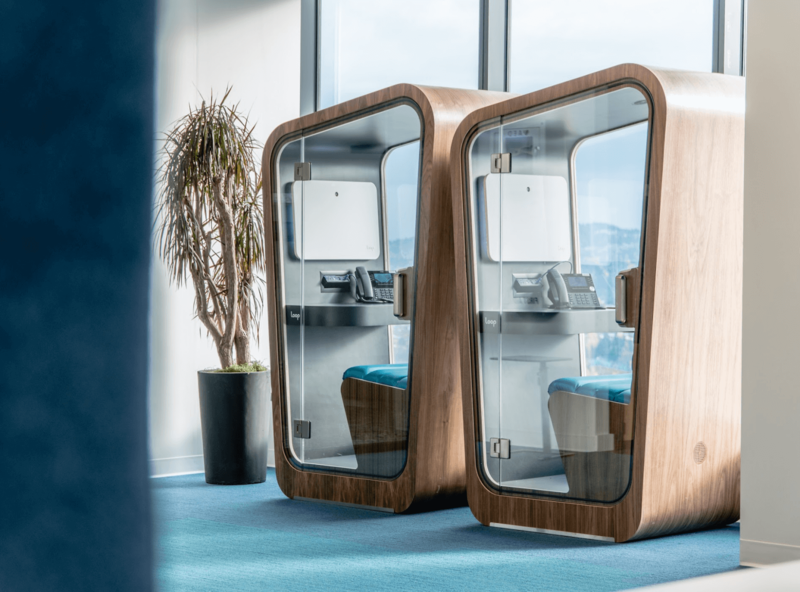 They were looking to add some additional privacy options for their employees to take phone calls while also adding to the overall aesthetic of the space. How did you find Loop Phone Booths? With so many other soundproof booths on the market, why did you choose Loop? I started a general internet search for phone booths. I found a couple of options and submitted those to the client (Pokémon) and architect for review. The architect liked the overall shape and the many customizable options the Loop Booth offered. The main reason the client chose the Loop Booth over other competitors was because they wanted a booth with a glass door and back panel. At the time, Nick (President at ONETWOSIX Design) had not done that before with any of the booths, but he was eager to have a discussion with his engineering team to see if it was possible. We also had Nick and his team look into making the booths wider. The team’s flexibility in design is what pushed them over the top. What stirred Pokémons’ need to find a solution to privacy and “too much noise” in the office space? Being that this was a new space with lots of open common areas, the architect did not want to use additional space for dedicated phone rooms. The phone booth gave them an opportunity to add to the overall aesthetics of the open/breakout areas all while providing a place for privacy. How was working with Loop overall? Would you recommend them to others looking for a similar product for their own offices? Absolutely, Nick and Brendan were great to work with. They were both very responsive and willing to take on any challenge we threw at them. Who else is talking about Loop Phone Booths? See all of our testimonials here! 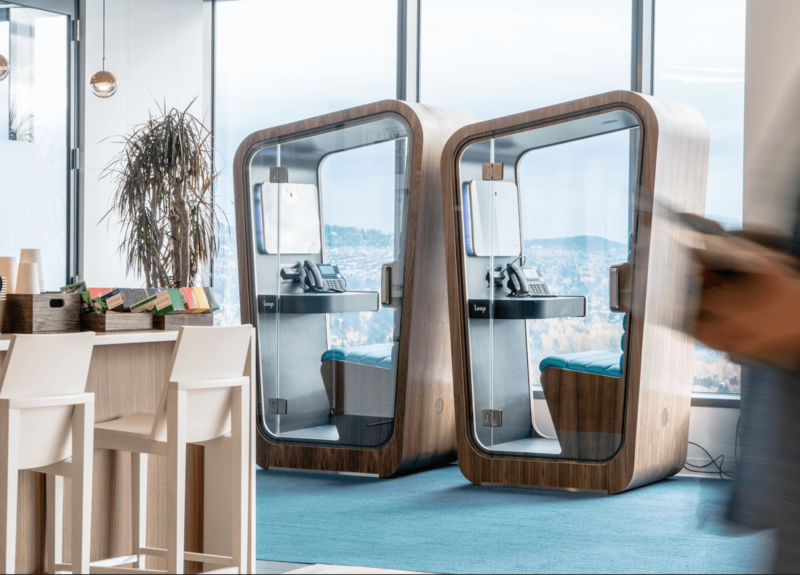 Interested in transforming your own open concept office with private phone booths? Be sure to check out our most recent blog post Why Your Open Concept Space Doesn’t Work, And How To Make Sure It Does.